Happy New Year’s Eve! I am excited to see what 2015 has to offer. I’ll be turning 25, finishing another 2 semesters of grad school, and hopefully doing more traveling! I also plan to just enjoy life as it happens, save more money, and make more time for friends and family, despite my busy schedule. This post about 15 things to STOP doing in 2015 also really struck me, since I could agree with all of them! Especially “stop saying yes all the time;” this is something I’m very guilty of. Looking forward to trying to cut down on these things in the new year. This week has been freezing here in New England, so I wanted to cook something warm and filling for dinner. 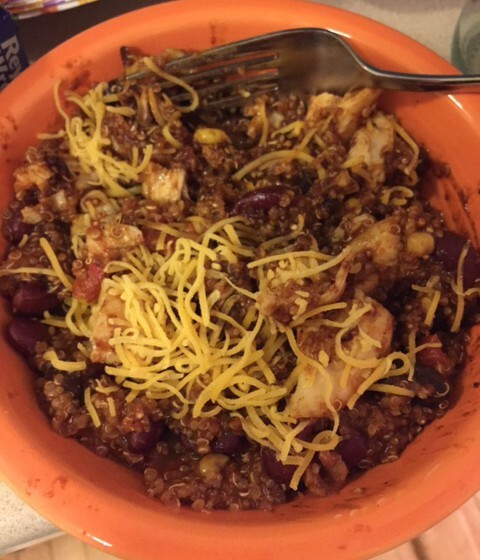 I found a recipe for chicken quinoa chili on Pinterest and adapted it a bit. It was delicious and perfect for this chilly weather! 1.) Preheat oven to 375 F. Spray a large baking dish with cooking spray/olive oil and place raw chicken in it. Top with a sprinkle of the taco seasoning and bake about 20-30 minutes, or until chicken is done. 2.) While chicken is baking, spray a large deep skillet with cooking spray and place over medium heat. Add peppers and onions and saute until soft, stirring occasionally. 3.) Add remaining ingredients, except cheese, and stir. Bring to a boil, cover, and reduce heat to low. Cook for 25 minutes, stirring occasionally, until quinoa is ready (it will look like it has popped open). 4.) Remove from heat, add in cut-up chicken, and let sit for 10 minutes. Serve warm with shredded cheese on top! **I used my Dutch oven and it wasn’t big enough, so I couldn’t add the chicken since I thought it would overflow. I ended up adding the chicken once I had portioned out the chili into 7 containers. But if your skillet is big enough, I would recommend adding the chicken once the chili is done and then let sit. 2014: My Blog In Review! New Workout Plan: AA Bikini Body! Lisa- you’re blog is awesome! I’m so proud of you. Anyway, I do a similar one I found on Pinterest with quinoa, turkey, sweet potato, baked beans. It’s pretty good and super easy.